Nonfiction – paperback; Ballentine Books; 272 pages; 2002. I have just discovered that the medication I am currently taking for a chest infection is the same medication given to people with Anthrax, so this might partly explain the snarky review which is to follow. Then again it might not. 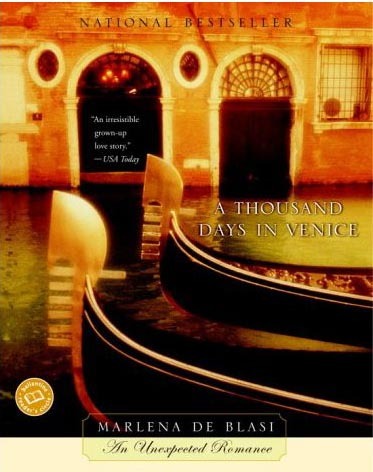 A Thousand Days in Venice is one of those lovely-looking personal travel memoirs that promises everything and delivers not very much at all. There’s no doubt that it is well written: the prose is clear, lucid and free from too much ‘waffle’ and de Blasi definitely knows how to write about food in a wonderfully evocative way. But the story — how can I say this without sounding too mean? — is woefully sappy and overly sentimental, which is fine if you like those things, but terrible if you don’t. Essentially it’s about de Blasi’s whirlwind ‘romance’ with an Italian whom she met on a work-related trip to Venice. This man had spied her before on a previous trip, had fallen in love with her profile, and when he spotted her again on her second trip he kept following her around like a lovelorn puppy. Apparantly de Blasi has never heard of the term ‘stalker’ before. Strangely enough, when alarm bells should have been ringing, de Blasi, a middle-aged American with a successful career and two grown-up children of her own, decides to give up her entire life for this man — a banker — she barely knows. The two of them don’t even share a common language and de Blasi hasn’t even seen Fernando’s house before she’s already sold hers and is winging her way to Venice to be with him. Of course, things don’t pan out as de Blasi had hoped (probably because the woman doesn’t seem to have a realistic bone in her body) and there are ructions in the relationship from woe to go. But somehow the marriage survives even when Fernando throws in his job because he wants to leave Venice to live elsewhere! All in all, a fairly cloying memoir that I really only persevered with because I enjoyed the references to particular places in Venice that I’ve seen or visited. It’s a pretty safe bet that I won’t be tracking down her second volume — A Thousand Days in Tuscany: A Bittersweet Adventure — unless my Anthrax medication turns me decidedly loopy! I suffered through 100+ pages of this before finally tossing it in the discard box. I posted a review (such that it is) on June 16th at my blog. I was so disappointed with this book too. I will not bother with this book, and coincidently, I think I am folding on another travel memoir I’ve been trying to finish called Almost French. It’s not bad, I’m just getting a little bored with it. Oh dear, I bought this book ages ago and have never got around to reading it…and you certainly have turned me off it some more! iliana, I thought it was just me, because when I looked at all the Amazon reviews it gets 4 and 5 stars!! Who are all these people that love this book? Sheri, I’m not a fan of travel memoirs at all — and I think this book has demonstrated why I usually don’t read them. Although, to be frank, this isn’t so much a travel memoir but a trashy romance! Hmm. I haven’t read this either…maybe I need to put up my other copy to be mooched as well. You never quite know with these sorts of books what you are going to get. I bought it because of the Venice setting, but she sounds rather annoying!